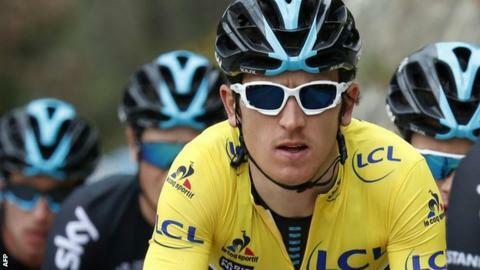 Geraint Thomas has withdrawn from the Volta a Catalunya ahead of the fifth stage of the race in Spain. The Team Sky rider had fallen to 53rd after the fourth stage, a 172km race from Baga to Port Aine, having been in 10th place overnight. Welshman Thomas, 28, said that he was still feeling the effects of his recent win in the Paris-Nice race. "Never good pulling out of a race but not been 100% since last week," he said on Twitter. He added that he needed to rest up because of a "big race next Sunday", referring to the one-day classic Tour of Flanders on 3 April. Thomas had finished Thursday's stage, which featured a mountain-top finish, 14 minutes and 33 seconds behind winner Thomas De Gendt of Belgium. The previous day's stage finished with Thomas 28 seconds behind leader Dan Martin, but after the climb to Port Aine he was 13 mins 40 seconds adrift of the lead. Thomas' team-mate Wouter Poels won stage five on Friday after breaking clear 4km from the finish of the 187.2km race to Valls. Colombia's Nairo Quintana is the overall race leader, seven seconds ahead of Spain's Alberto Contador with two stages remaining. Two-time Tour de France winner Chris Froome, Thomas' Team Sky colleague, is 46 seconds back and eighth overall. Saturday's penultimate stage is expected to end in a sprint finish with the finale taking place in the hills around Barcelona.